I’ve spent some of the best years of my life waiting in line at Walgreens. And some of the worst. Joy and pain, love and hate, bandaids and cat food, all while the earth spun on its axis, all while it slowly circled the sun. Everyone understands prices must be checked, bills debated, coins emptied on countertops and stacked in rows. Maybe you thought this would take five minutes. Maybe you thought you could still catch the next train home and enjoy two hours of peace before going to bed and returning to work in the morning. But then May becomes June, and you see all those people still in front of you, and you definitely don’t passive-aggressively tap your foot or sigh loudly or stare at the register or look at your watch for the twentieth time when that mother with out-of-control kids can’t find her coupons. Obviously, your problems are important, but you’re sensitive and reasonable, and you never view other shoppers as obstacles, never scapegoat them for outward differences, never blame the underpaid employees, never fume inwardly when an old person can’t figure out the card swiper. It’s a chance to learn about these people. Like that time the cashier caught up with her cousin’s babysitter’s grandmother, who recounted all the terrible things Christina lets her kids do. Outside, the leaves turned from green to red and yellow, and everyone in line waited patiently, glad to witness the chance meeting, not a little saddened when the manager came over and made his get-back-to-work face before opening that weird side register in the cosmetics department. No one has all the answers. 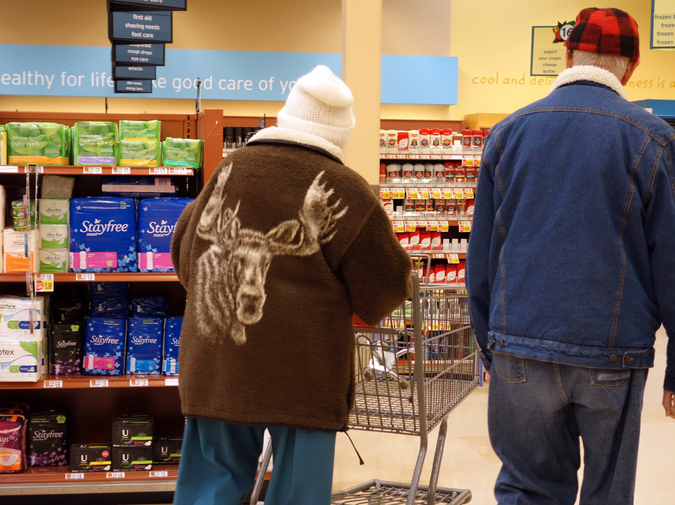 What could the man returning a fleece bodysuit say to the woman behind him getting ready to buy exactly the same item? He furrowed his brow and took a deep breath, shaking his head, searching for the words. Saturn ascended as she studied his face and implored his wisdom, but deep down they both knew one size never fits all, and of course who could say how cold the nights would be when they got out of there, whether fleece pajamas would even be necessary at that point? Streams dug rivers along mountains, stones formed layers in the beds of ponds and lakes, and I saw acts of kindness that melted my heart and acts of depravity that steeled it. Everyone exulted in the bounty of a mother who bought her son gummy worms, teaching him it’s completely untrue he never gets anything, which she just didn’t want to hear anymore. But then the stars, once aligned, shifted places, and a man in a pin-striped suit disregarded the single line customers had formed and took his greeting card directly to one of the registers. Hardened by distrust, we re-queued, and one guy in the very back put down a stack of five microwave pizzas and stormed out in a huff. Some things really are too good to be true. As the glaciers melted, an old man pushed up a shopping cart filled with mini ravioli, but then he was shown the fine print on the flyer, which specified only ten cans per customer, and his smile uncurled as those glaciers refroze. He insisted there had to be more in the storeroom or in the delivery trucks currently en route while the rest of us made mental notes about urban geography and the way it makes poor people pay too much for off-brand beans and bread and cereal. But a rule was a rule, the manager explained, and that applied to beef, cheese, and mini. There were sounds of Christmas when I reached the end of the line myself and looked back to assess the ravages of time: smooth skin made craggy, brown hair made silver or lost altogether. I thought of all the recitals and graduations I’d missed, all the weddings and funerals. Was it worth a bottle of sleeping pills and a pair of deodorizing insoles? I swiped my card immediately and said no bag was necessary, then swiped again, and again, and finally it took after the scanner priced my insoles, which ended up in a bag anyway, but I just let that go and walked straight out of there, squeezing myself past a family with an enormous teddy bear but not waiting to hold the door because, as you well know, those things work by motion sensors, opening and closing as necessary, and there’s a pristine logic in that we can all appreciate. J.H. Pearl teaches English at Florida International University. His non-academic writing has appeared in Fugue and Gastronomica.